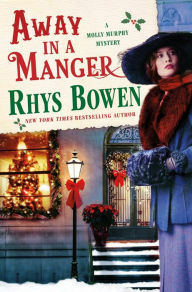 Away in a Manger is Rhys Bowen's latest Molly Murphy mystery. It's Christmastime in 1905 New York City, and Molly Murphy Sullivan is looking forward to the holidays. As Molly and her son and ward listen to carolers in the street, they see a beggar girl huddled in a doorway singing "Away in a Manger". When they give her a quarter, they see a bigger boy take it from her. But, appearances are deceiving. He's her older brother. They've come from England, and their mother has disappeared. Molly's questions leads her into an investigation that goes up to the highest levels of New York society. 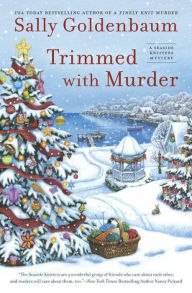 Or, you could win Sally Goldenbaum's Seaside Knitters mystery, Trimmed with Murder. Izzy Chambers Perry and the other Seaside Knitters are knitting tiny ornaments to decorate a tree for the first annual tree-trimming contest in Sea Harbor. And, they're even happier when Izzy's younger brother, Charlie, arrives to volunteer at a local clinic, bringing a hitchhiker with him, a young woman returning to claim her inheritance. When she's found dead, Charlie is the suspect. The Seaside Knitters will have to find a killer to restore joy to the season. Which Christmas mystery would you like to win? You can enter to win both, but I need separate entries. Email me at Lesa.Holstine@gmail.com. Your subject heading should read either "Win Away in a Manger" or "Win Trimmed with Murder." Please include your name and mailing address. Entries from the U.S. only, please. The giveaway will end Thursday, Dec. 3 at 6 PM CT.
Maybe these books would help to get me into the holiday spirit! They sound really good. I love Christmas mysteries and tend to read them throughout the year. Thanks for the giveaway, Lesa. These books sound delightful for the holiday season. Thank you for the giveaway.